The best time to seed your lawn is during the winter or fall season. The reason behind this is simply because both seasons are periods when the grass will be going into dormancy in preparation for the coming cold of winter. Also, the heat from summer would have left your lawn in dire need of replenishment. Properly done seeding will help your lawn to regain its lost glory as dried out patches and scorched grasses may not have the capacity to regrow properly by themselves. There are a number of online lawn mowing services in Texas that can deliver professional lawn seeding to prepare your lawn for coming season. Seeding in fall and winter allows your lawn grass to have a head-start in their development process so that as winter is ending, they would have completed a part of the growth cycle in readiness for spring and summer. If planted in spring, the germination cycle might stretch into summer and this might be too late. For best results, the best line of action would be to contact a Lawn Care service Texas to handle your lawn reseeding for you. Seeding your lawn grass helps it recover from the impact of the harsh weather conditions and other detrimental effects. Below are steps on how your lawn can be reseeded in either fall or winter. This is as simple as it sounds. You will need to buy a grass type that will suit your lawn best. There are lawn grass types that grow best in cold season. If in doubt, you might have to employ a Lawn care service Texas to handle this for you. It will be of note to consider the features of the product – is it tolerant to droughts, resistant to weeds and pest attacks. Another fine point to check for is the pricing of the product you are buying too. You may need to prepare the soil before seeding your lawn. Before any seeding activity commences, soil preparation is important for optimum growth and development of the grass seeds. You can contact a professional lawn care service Texas for their going rates on soil preparation. Soil preparation involves loosening the top 2 to 3 inches of the soil, removal of debris, breaking up the soil into smaller clumps and aeration to allow easy passing through of nutrients and water. The next step after aerating and preparing your lawn grass for seeding is planting the seeds. Grasses experience lowered metabolism during fall and subsequently winter. To seed your lawn, you can access professional information from online lawn mowing services to easily do it yourself. You will need to use your hand or a mechanized spreader to disperse the seed evenly through-out your lawn. It is important that this done correctly to save your lawn grass from growing in patches. After spreading the grass seeds, they will need to be protected to an extent to save them from the harsh elements at their tender stage of growth. This can be easily done by dragging some soil over the already-spread seeds. Professional lawn care services in Texas can do this using a seeding mulch and fertilizer application in conjunction with the seeding activity. This provides a superb growing environment for your lawn grass to grow optimally. Properly applied fertilizer provides your lawn grass with the extra nutrients to improve their metabolic activities. 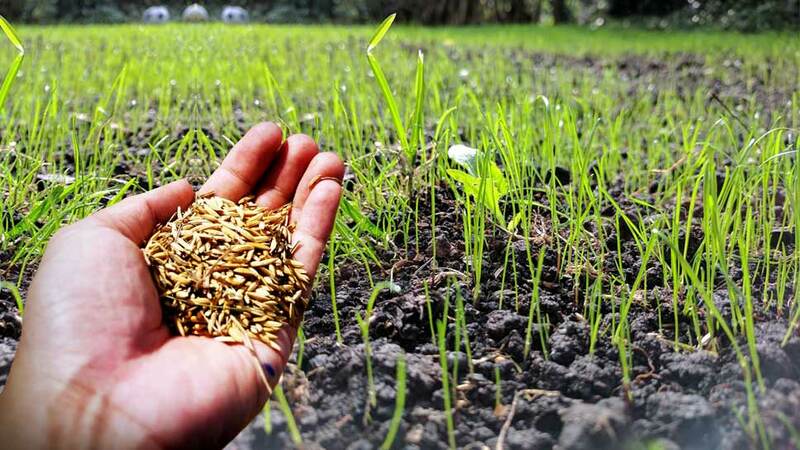 It is ideal to apply fertilizers before or after seeding so that they young grass seeds will utilize it to the maximum. Regular watering also keeps the soil moist enough to encourage the permeation of soil nutrients through the soil to the grasses. It is advisable to water the new seeds lightly but regularly until new grasses appear up to a length of 2 inches at least. If you are in need of a professional lawn care service in Texas, you can check out GoMow’s lawn care services to know how you can be served. Click below to get a quick quote.